We had moved closer to the sea, and Kjersti and I agreed that we had to get a couple of kayaks and begin paddling again. I was going on a trip to Bergen for job reasons, and saw that there was a "build your own kayak" course there the same week. Exciting. We had been considering fibreglass, but it would be fun to have a really traditional kayak. Additionally, I would find it fun to build it myself. After doubting whether it would be a good idea to spend a week on this, I signed up, and watched some long boards quickly take shape and begin to resemble a kayak. We had just built a house, and we were used to right angles and millimetre precision being important. There were no such criteria here. Instead, it was all about fine curves, good shapes and approximate measurements. For example, the kayak was to be about three times as long as I was tall, and as wide as my own width plus two fists. The distance between the ribs was about as far as the distance between my outstretched first finger and thumb, or a "small span" as Anders called it. 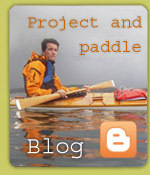 Each participant could design their own kayak. I was fascinated to watch my kayak assume its graceful, but flexible and beautiful form. 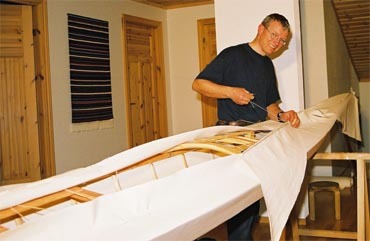 When I came home, it didn't take long before I bought a kit of materials from Anders, and began building a kayak for Kjersti in the garage. I had doubts about bending the ribs myself, so I took a trip to Anders to seek his aid. This is something that requires practice, and it's a joy to see him shaping them.